Home > Resources > Recover Android > How to Restore Contacts from Broken Android Phone? That would be a big disaster for Android users to have their Android mobile phones broken down and lost all contacts from the dead or broken Android phones. They must be eager to recover those lost contacts on it so that you can keep connection with your friends and families normally. If not, you have to spend a lot of time to identify the missing phone numbers and input them back to your Android mobile phone one by one. Fortunately, you can get back lost and deleted contacts from broken Android mobile phone with the help from a third-party contacts recovery tool for Android - Broken Android Data Extraction. 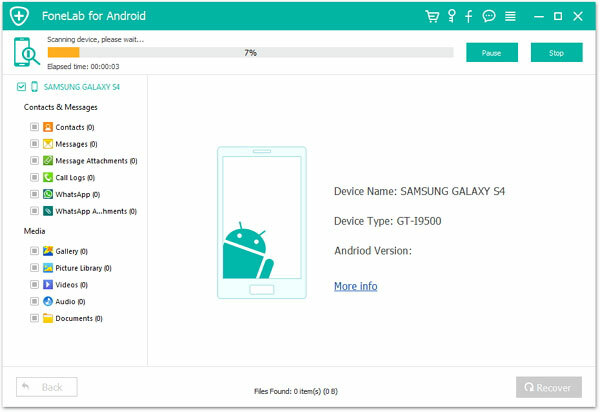 It is right for Android users to rescue contacts, SMS, photos, videos, music, etc. from Android phone to your computer. This Android contacts recovery software can not only rescue the phone numbers, but also email address, company name, job title and other more contacts information. 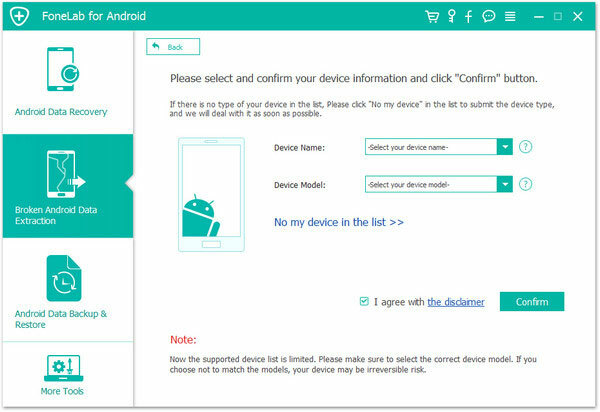 Currently, this program only supports Samsung device in this mode, but it will work with more Android phones soon, such as HTC, LG, Sony, Motorola, etc. The program is so easy to operate with a few steps along with several mouse clicks. You shouldn't miss it. Now, please click the following button to download its demo version for free. If you are a Mac user, download the Mac version please. The operations on both Windows and Mac versions are the same. 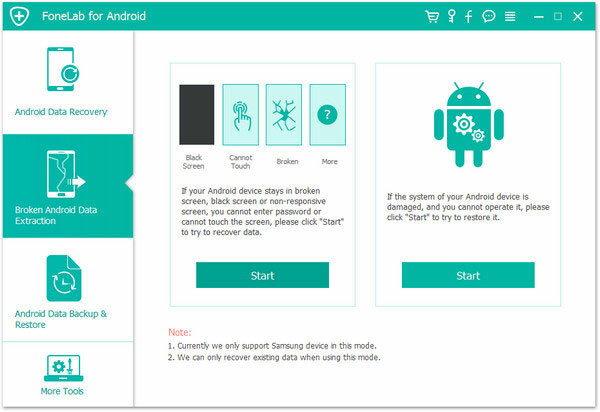 Launch Broken Android Data Recovery on your computer and connect your broken or dead Android to computer via USB cable. The program will detect the connected Android phone instantly. Click "Broken Android Phone Data Extraction" from the left. Step 2. 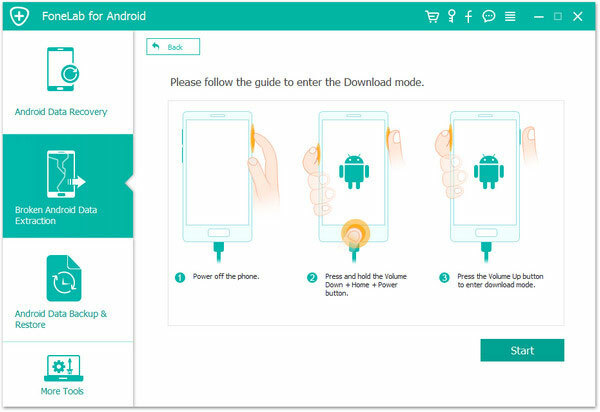 Click the "Start" button on the program interface.Then choose your phone's name and mode and click "Confirm" to see whether your Android phone is supported to be fixed by the program. Step 3. Follow the guide on the interface to enter the download mode. After that, click "Start" button to fix your phone. Step 4. After the above operations, the program will scan your phone data automatically. Once the scan is finished, you can preview and scanned out data and select "Contacts" you want back. At last, click "Recover" to save the selected contacts to computer. Perfect! Now you have already recovered all your Android contacts from your broken Android phone successfully.